One of the more distinctive monuments found in the churchyard of St Giles in the Wood is the Braginton chest tomb. This ivy covered chest tomb commemorates the 1842 death of George Braginton and the 1850 death of Richard Braginton, children of George Braginton and Margaret Grace Vicary. Beside the chest tomb is the grave of George Braginton's parents, Richard Braginton and Ann Dwerryhouse. Richard Bragington, the son of Richard Braginton and Ann Blatchford, was baptised at Tavistock, Devon on 4 Jun 1784. On 13 Sep 1806, at St Nicholas Church in Liverpool, Richard married Ann Dwerryhouse. Ann was born about 1788 in Liverpool. Richard is possibly the son of Richard Braginton, Quartermaster Sergeant of the South Devon Militia, who died in Leicester on 15 Feb 1812 at the age of 60, and whose monument at St Martin's, Leicester was erected by Lord Rolle. Richard Braginton was steward of Stevenstone during the period between the death of Lord Rolle in 1842 and 1856, when Lord Rolle's nephew and heir, Mark Trefusis, attained his majority and assumed the surname of Rolle. Richard had been connected with the management of the Rolle estates since 1814 and lived at Little Silver in the neighbouring parish of Great Torrington. His five youngest children were baptised at St Giles in the Wood: Amelia Dwerryhouse (12 Apr 1816), William Dwerryhouse (4 Jan 1818), Louisa Dwerryhouse (5 Jan 1820), Ann Amelia (26 Nov 1823) and William Dwerryhouse (2 Feb 1822). 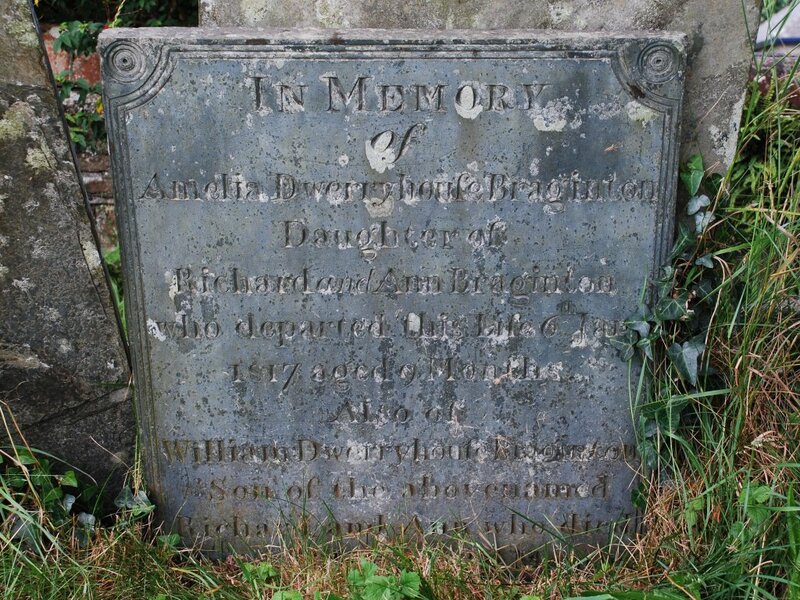 Both Amelia Dwerryhouse Braginton and the first William Dwerryhouse Braginton died in infancy and are buried at St Giles in the Wood: Amelia on 13 Jan 1817 and William on 3 May 1818. An older brother, Richard Braginton was born about 1812 and buried at St Giles in the Wood on 5 Apr 1825. Ann, the wife of Richard Braginston, died at Little Silver, Great Torrington, Devon and was buried at St Giles in the Wood on 21 Sep 1866. 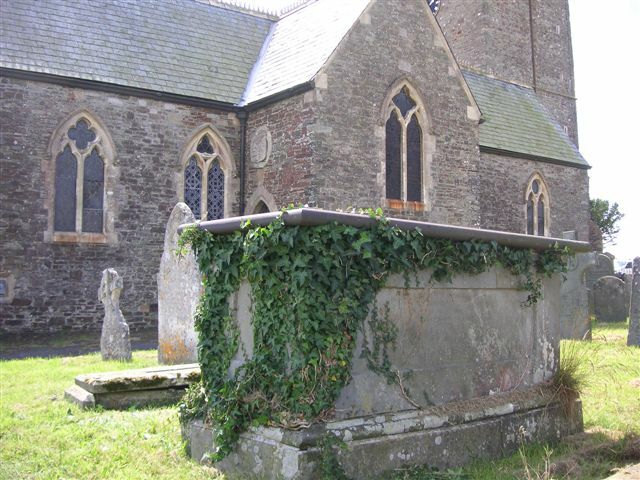 Richard died at Compton Gifford, Devon on 16 Jan 1869 and was buried at St Giles in the Wood on 21 Jan 1869. George Braginton, the oldest son of Richard Braginton, was baptised on 28 Feb 1808 in Ottery St Mary, Devon. On 13 Jan 1835, at St Giles in the Wood, he married Margaret Grace Vicary, the widow of William Cotton. Margaret Grace Vicary, the daughter of Thomas Cornish Vicary and Margaret Fry, was baptised at Great Torrington, Devon on 6 Dec 1807. Her marriage to William Cotton produced two children. Charles Newell Cotton was born in Barnstaple on 24 Mar 1830 while his sister, Fanny Eleanor William Cotton was born after the death of her father in Barnstaple on 26 Oct 1832. George Braginton was a merchant and banker, and served as both an alderman and as the mayor of Great Torrington on a number of occasions. The Rolle Canal, completed in 1827 was leased to George from 1852 until about 1865 when control of the canal passed to Mark Rolle. George was also a shipowner. George BRAGINTON's bank, Braginton, Rimington & Co., failed and George declared bankruptcy in 1865. He subsequenly faced a number of lawsuits as a result of his "rash and hazardous" dealings, and it wasn't until 1874 that the bankruptcy was discharged. George and Margaret Grace had six children baptised at St Giles in the Wood: Margaret Ann (1835), Clara Louisa (1837), George Vicary (1840), Georgina Merrill (1843), Alice Jane (1845) and Richard George (1849). George Vicary Braginton was buried at St Giles in the Wood on 7 Jan 1842. Richard George Braginton was buried on 16 Jul 1850. George lived at Moor House, St Giles in the Wood but moved to Compton Gifford, Devon after his bankruptcy. Margaret Grace Vicary died 24 Nov 1868 at Compton Gifford. George married Emma Dobson in 1880, and died at Compton Gifford on 9 Jan 1886. Both Margaret Grace and George are buried in Ford Park Cemetery in Plymouth. Louisa Dwerryhouse Braginton, the oldest surviving daughter of Richard and Ann, married James Kidwell at St Giles in the Wood on 9 Oct 1850. Their four children were all baptised at St Giles in the Wood: James Braginton (1851), Richard Amos (1854), Louisa Braginton (1856) and William George (1860). James Kidwell died in 1885 in Liscard, Chesire. Louisa Dwerryhouse Braginston died in 1901 in Liscard. Ann Amelia Braginton, the youngest daughter of Richard and Ann, married twice. She married John Campion at St Giles in the Wood on 17 Oct 1849, and had two daughters: Kate Cordy (1853-1863) and Florence Annie (1856-1862). Florence Annie was buried at St Giles in the Wood. John Campion died in 1856 in London. Ann then married William Valentine Bird, a physician, in 1863 in Liscard, Cheshire. Ann and William had a son, Harold Braginton Bird, who was born in 1864 in Liscard, Cheshire and who became a clergyman with the Church of England. Ann Amelia Braginton died in 1908 in Chiswick, Middlesex. William Dwerryhouse Braginton, the youngest son of Richard and Ann, was a merchant and shipowner who lived in Northam, Devon. The names of several of his ships are known: William Rennie, a barque of 237 tons built in Liverpool in 1850; Louisa Braginton, a barque of 280 tons built in Bideford, Devon in 1856; Annie Braginton, a barque of 413 tons built in South Shields, Durham in 1860; Georgiana, a brigantine of 257 tons built in Bideford in 1853 that was involved in a collision with the brig Orient in April 1867 at Appledore; Florence Braginton, a barque of 367 tons built in Sunderland, Durham that collided with the barque Superb off the coast of Norfolk in Dec 1864; Clara Louisa, a brig of 214 tons build in Bideford in 1854; and Margaret, a brigantine of 139 tons, build in Bideford in 1835. The Margaret, the Georgiana, and the Clara Louisa were originally owned by George Braginton, however, ownership had transferred to William well before George's bankruptcy in 1868. Available records show that the Annie Braginton sailed to places as varied as New York, Buenos Aires, Penang, Singapore, Bombay and Nelson, New Zealand. She was wrecked off the coast of India in 1884. The Louisa Braginton is known to have made her inaugural ocean voyage between Liverpool and South America. In 1860, her captain was tried in Liverpool for bringing Chilean political prisoners to the United Kingdom, and in September of 1866, she sailed from New York for the United Kingdom but never arrived. William Rennie was lost in the Bay of Biscay in 1856, however, the captain and crew were rescued. The Florence Braginton was sold at auction in 1867, and but lost in 1877 off Cape Horn. William Dwerryhouse Braginton married Louisa Ley, the daughter of James Smith Ley of Bideford in 1855. William and Louisa had five children: Annie Louisa (1857- ? ), Louisa Ley (1858 - ? ), William Douglas (1860-1937), who became a clergyman with the Church of England, Florence (1862 - ?) and Richard Stewart Ley (1864 -1866). Louisa Ley died in 1872. William Dwerryhouse Braginton declared bankruptcy in 1879 while he was living in Bristol. He died at Dawlish, Devon in 1888.